Katie Sandford has just gotten an interview at her favourite music magazine, The Line. It's the chance of a lifetime. So what does she do? Goes out to celebrate - and shows up still drunk at the interview. No surprise, she doesn't get the job, but the folks at The Line think she might be perfect for another assignment for their sister gossip rag. All Katie has to do is follow It Girl Amber Sheppard into rehab. If she can get the inside scoop (and complete the 30-day program without getting kicked out), they'll reconsider her for the job at The Line. Katie takes the job. But things get complicated when real friendships develop, a cute celebrity handler named Henry gets involved, and Katie begins to realize she may be in rehab for a reason. Katie has to make a decision -- is publishing the article worth everything she has to lose? Spin by Catherine McKenzie is hands down one of my favorite chick lits ever! Thank you Harper Collins for giving me a copy because I absolutely LOVED it! The blurb had me a little skeptical at first because well, it's about Rehab. I assumed the book would go all serious on me and I wouldn't like it but thank goodness it didn't! I'm not sure what I enjoyed more, Kate/Katie's character or the plot itself! The credit goes to the author either way because it's her writing that kept me interested. Kate is possibly an alcoholic but she doesn't seem to think so. After a job interview gone wrong and rather strange circumstances, she's forced into Rehab on an undercover writing assignment which might land her the job of her dreams at 'The Line' as a music reviewer. It was all supposed to be an act to get the dirt on a famous celebrity who has checked into Rehab but Kate did not expect to actually be affected by her stay there. Along the way, she makes friends, finds a higher power and even falls in love. I absolutely adore Kate! She's a naive thirty year old woman who has an alcohol problem and a compulsive need to lie. In short, she's a mess. She's lost and broken but at the same time incredibly self-assured and has a killer wit! 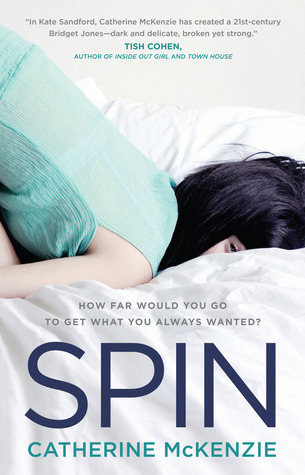 Spin's a story about a woman finding herself and getting responsible with her life written in a funny and enjoyable way! At the end of the novel, I was scouring Goodreads for other novels by Catherine McKenzie. Utterly charming and I definitely recommend it to all the Chick Lit lovers out there! I got this through netgalley and I'm yet to read it! Thanks for the review :D Now I'm super excited to check it out! I think this sounds like a good read though it is something that I might not have discovered on my own. I have this on my to-read list over at Goodreads! Thanks for the review! I can't wait to read it! At first thought I'd think I wouldn't read this but it actually sounds pretty good so thanks for sharing!